Anyone looking for antiperspirant for excessive sweating would be wise to consider the possibility that Drysol Antiperspirant may be the solution to the problem. Unlike OTC commercial antiperspirants and deodorants, Drysol was formulated as an antiperspirant for hyperhidrosis, a condition of excessive sweating. Drysol is an aluminum chloride antiperspirant. It is formulated with two key ingredients: Aluminum Chloride and Alcohol. Unlike antiperspirants that only seek to temporarily block sweat locally, Drysol Antiperspirant is proven to treat the faulty communications in the sympathetic nervous system so that sweat glands are not triggered. Alcohol is used as a stabilizing base and it is also an effective antibacterial which could help to eliminate odors. 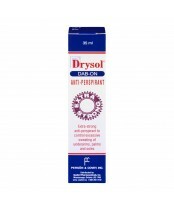 Drysol Antiperspirant should be applied just before bedtime to clean, dry skin. It is absolutely important to make sure there is no sweat or water present. It should be used for 1 to 3 nights at the onset, and then it can be applied once or twice each week after that. In the morning it is only a matter of washing it off prior to applying deodorant. There are two common strengths which are a mild 6.5% solution and a 20% extra strength formulation. The mild solution is ideal for sensitive areas such as the face, the soles of the feet and the palms of the hands. Drysol is not your typical antiperspirant. It is designed for correcting faulty messages in the body that trigger unwarranted amounts of sweat. It has been prescribed by doctors for years, and is found to be a safe and effective treatment for hyperhidrosis. 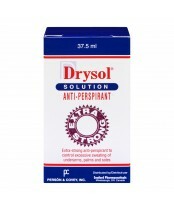 In Canada, Drysol is a top antiperspirant for excessive sweating, recommended by many.